Note: You can enter this giveaway two (2) times per e-mail address per day. Deadline is 11:59PM ET 5.3.19. Make magic in the kitchen, even on days when you’re short on time. 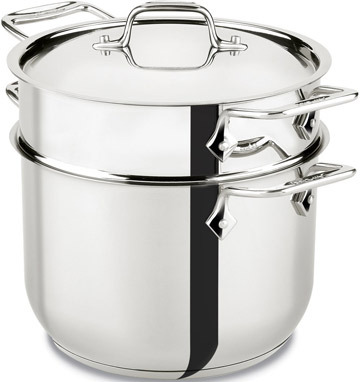 Not much is quicker than a pasta dinner and the All-Clad 6-Quart Pasta Pot with its perforated insert is perfect for preparing pasta, whether it’s Spaghetti with Breadcrumbs or a spicy Puttanesca. You’re not limited to making macaroni in it either, the pot is also ideal for steaming and blanching vegetables and shellfish – no wand required. The stainless-steel construction won’t react with food and the aluminum warp-resistant base ensures fast, even heating. Clean up is also a breeze and can be completed almost as fast as you can say abracadabra. NO PURCHASE NECESSARY TO ENTER OR WIN. Void where prohibited by law. Open to legal residents of the 50 U.S., D.C. and Canada (excluding Quebec) who are at least eighteen years old at the time of entry and have internet access. Begins on 3.8.19 at 12:00:00 a.m. ET and ends on 5.3.19 at 11:59:59 p.m. ET. To enter the giveaway, submit your full name and email address on this form. Odds of winning this giveaway depend on the total number of eligible entries received. Only two (2) entries per email address per day. Sponsored by Leite’s Culinaria, Inc. For more information, visit our Official Rules. Be sure to add giveaways@leitesculinaria.com to ensure notification if you are the winner.